John Rogers opened Gallery 29 in November 2004. He has a Batchelors and Masters degrees in art history and many years experience in an international auction house. He has worked and studied in Ireland, England and the U.S.A. Immersed in art and the art world, he had an epiphany 6 years ago when he purchased his first vintage poster, obsession ensued. The happy result of this passion is Gallery 29 where Johns extensive knowledge of art and design, the world of collecting and great eye for beauty, combine to offer an unparalled selection of posters. 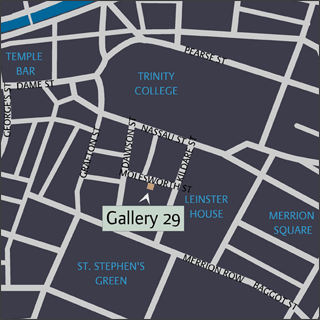 Our gallery space is conveniently situated just below Jorgensens' Fine Art Gallery on the lower ground floor of 29 Molesworth street in Dublin 2, the cultural heart of the city. It has been specially designed with poster viewing in mind - it is spacious, neutral and well-lit with both natural and artifical light. 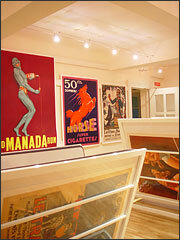 All posters on this site are on display for viewing in our gallery, so please feel free to drop in and have a look. 10am - 5.30pm, Tuesday to Saturday.